Today it feels great to be back in Shanghai. The sun is shining hard and hot, and the sky is bright blue, with small white clouds scudding across it. Summer is in full swing. I just want to get on my bike and get out there. The Sunday morning streets are not busy and I head direct to Baker and Spice on Anfu Lu for coffee and toasted pane coi sante (Italian-style fruit bread). 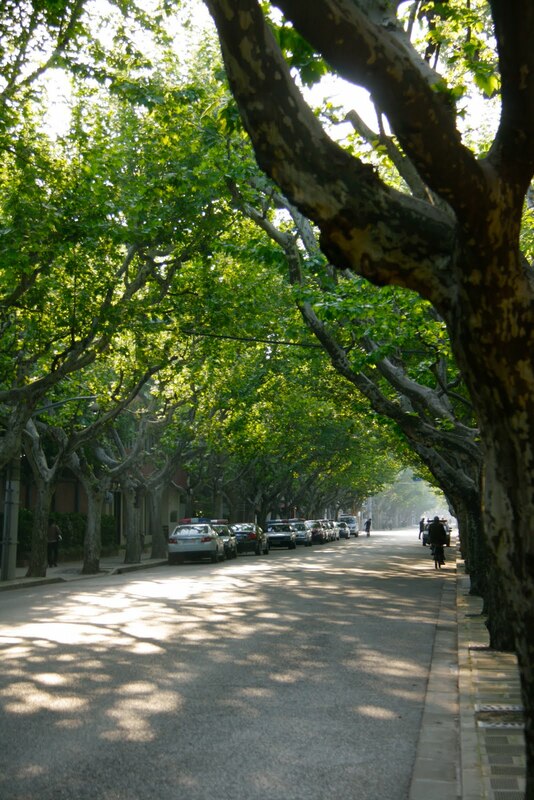 Anfu Lu is looking beautiful - the plane trees are now leafy and dense, and their tops meet together in the middle of the street, creating a long green archway. The coffee is good, I think it's almost the best in Shanghai. Actually, reflecting on all the bad coffee I've drunk in the last year, it is the best. 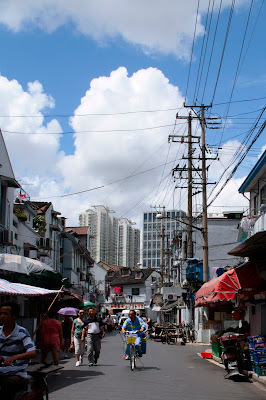 I head back along Anfu Lu to Changle Lu. There are certain streets in the French Concession that are lovely for cycling, and if you pick the right route you can cycle all the way to the Old City without ever going along a main road. From Changle Lu I head south along Xiangyang Lu until I hit the start of Nanchang Lu. I never tire of riding along here....all the familiar shops and faces.....the fruit man, the egg man, the vegetable lady, the bike repairer, the watch repairer. Today, for once there are no wedding cars being decorated. It must be an inauspicious day for Chinese marriage. The sun has climbed higher but Nanchang Lu is shaded along its length, and almost at the end I pass the entrance to Fuxing Park. As usual, the park is busy, busy, busy and several people toting long ornamental swords are going off to practice.....whatever it is you do with long swords. Bikes aren't allowed in the park though, so today I don't go in but keep riding. Nanchang Lu crosses over an 8-lane road now, and I am heading towards the old city. I pass by Xintiandi, where the crowds are already lining up at The Site Of The First National Congress Of The Communist Party Of The People's Republic Of China. I wonder why every official name here has to be so wordy - why can't they call it something short and snappy like 'Big Brother World' or 'Commumania'?? Anyway.....past Xintiandi the houses are older and more interesting as I get into the old city proper. Now the cycling gets interesting too as every intersection becomes an opportunity to go through a red light. Just as I'm coasting along I have near-collisions with a 3 year-old boy, a 5 year-old boy, and a motorbike in rapid succession. The boys are racing across the narrow road to join their big brother who is doing a very public crap onto a piece of folded up newspaper on the footpath. I keep going - I'm heading along Fangbang Lu now and I see old faces every few metres - Mr Pork Bun, and the fellows at the Langzhou hand-pulled noodle restaurant. 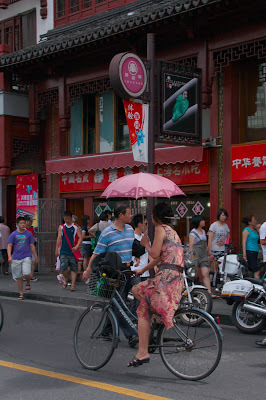 Then I spy the big stone gate of Shanghai Old Street, and beyond it, Yu Yuan. 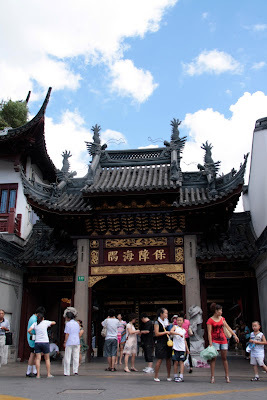 I don't really need to visit the gardens again today but I go through the bazaar for no other reason than the visceral pleasure of being elbowed by eighty Chinese people at once, some of them children. That was perhaps a mistake....but I opt for more elbowing nearby, in the air-conditioned mayhem of the Commodities Market. It's past midday now and I'm absolutely starved. Leaving the Yu Gardens area and riding back along Fangbang Lu I can't help but stop at two favourite places - the Bird and Insect Market, and across the road, the Dongtai Lu Antiques and Curios Market. The sound of the crickets is deafening before I even step into the Insect market - cricket season is here, and I see three men poring over a book of cricket varieties the same way I pore over shoe catalogues. It's the same at the antiques market - small clusters of men analyzing some jade piece. One of the stallholders who knows me by sight asks me to interpret the strange foreign writing on a large Oscar the Grouch style tin trash can she has just acquired. 'Lawsons 1944 32 gal' says the inscription. Not satisfied, they get me to poke my head deep into the trash can to read what is on the base - 'Reeves pat 1566-8734'. I use my mobile phone dictionary to show them the Chinese characters for 'patent'. They appear happy. I wonder how on earth a 66 year old American trash can ended up in Shanghai. A mystery. Now I'm really starving, and very hot. Actualy past starving, so I cheat and have late afternoon ice-cream at Haagen-Dazs for lunch as I cycle back past Xintiandi towards home. A perfect Shanghai Sunday has to end with great food. It's often Chinese food but tonight, after a short rest at home I head back out on my bike for dinner at hoF on Sinan Lu. I've been holding off writing about hoF because it's a real treasure - a tiny chocolate-box sized restaurant serving wine and desserts, with chocolate being the main focus. Enough said. A glass of red, a serve of their signature dessert, Chocolate Sinan Lu - heaven. A perfect end to a perfect Shanghai day.